LM: Vision: TopCoder is at it again! Going to work over the Buy page. TopCoder is at it again! Going to work over the Buy page. Today our next major TopCoder Design competition is going live. Due on March 26th, the submissions of the entrants to this competition will compete for a prize purse of $1350 and take Local Motors forward into the Buy environment where we will engage all future customers of the Rally Fighter and help them to prepare for their purchase of a revolutionary automotive experience. 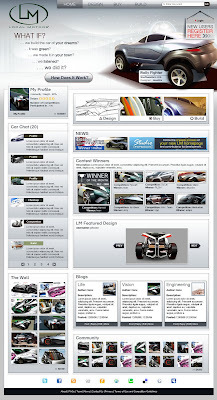 To create a "buy section" for the www.local-motors.com website. The purpose of this section is to promote the upcoming Local Motors production vehicles to prospective customers. These pages will also be used to execute a customer transaction that both collects deposits while also assigning these customers a number that determines the order in which their vehicle and build experience will be available. Local Motors is a new car manufacturer of limited production, environmentally friendly, community-designed specialty vehicles where customers participate in the build process in a build program at the micro-factory. This web site hosts a web community of car enthusiasts, transportation designers that collaborate to assist the design actual production vehicles. This "Buy" page provides the first page/section specifically for Local Motors customers. To watch the competition in action (check out the TopCoder page), sign up to follow the forum and then be sure to check back on the 26th when the submissions will be in and we will see what the community delivers. This is a big step forward for the new site look, for Local Motors, and for our customers.